Sean Walsh, Jack Parkin and Jared Gaynes made the trip down to the Jersey Shore on Monday to represent LISOT, NY and CT at the New Jersey State Opti Championships. And as has been the case recently, they represented quite well. The Brant Beach Yacht Club, on Long Beach Island, hosted the regatta in place of the Shrewsbury Yacht Club which was originally scheduled to host last June. The first day of the two day regatta started quite well with beautiful weather and a nice breeze in the low teens. The race committee got in two races before taking a break for lunch. Jack and Sean each took a bullet in the first two races, with Sean just nosing out Jared who had led the entire first race until Sean got him at the finish. After lunch it was tough sledding for many of the sailors as the clouds and rain came in, and the wind picked up to the low to mid twenty’s before racing began again. With plenty of inexperienced sailors in the fleet the spectators and safety boats spent most of their time in the afternoon picking up sailors who were having trouble. Only about half of the boats finished the third race, including Jared who finished in 10th even though he flipped his boat. The race committee had to cancel the rest of the days racing early as there were not enough race committee boats left with so many kids heading into shore. Tuesday morning started ominously with 100% cloud cover, rain, and white caps in the inner harbor. The breeze was blowing steady in the low 20’s with gusts to 35. The race committee postponed until 10:00 at which time they had to cancel the rest of the days racing due to the high winds. LISOT sailors took 3 of the top 6 spots overall, with Sean in 6th, Jack in 5th and Jared in 3rd place. 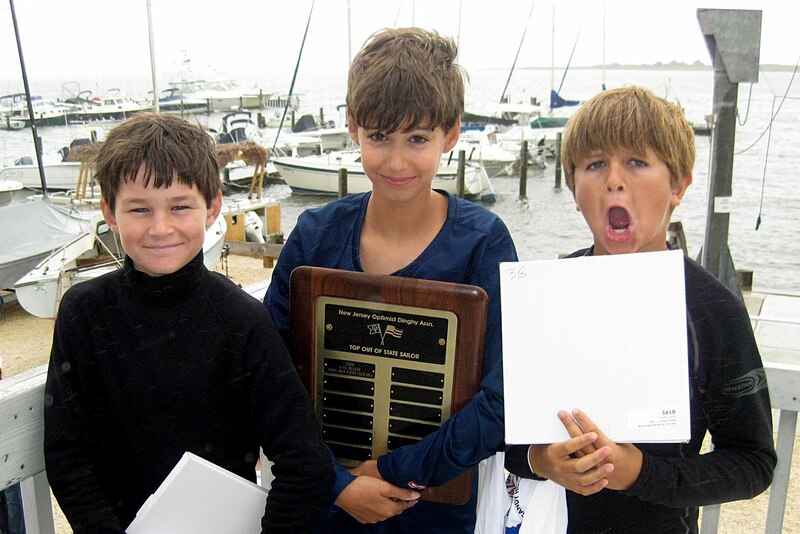 They all took home silver, with Jared also taking home the perpetual trophy for the top out of state sailor. Sean and Jack came in 4th and 3rd respectively in blue fleet.